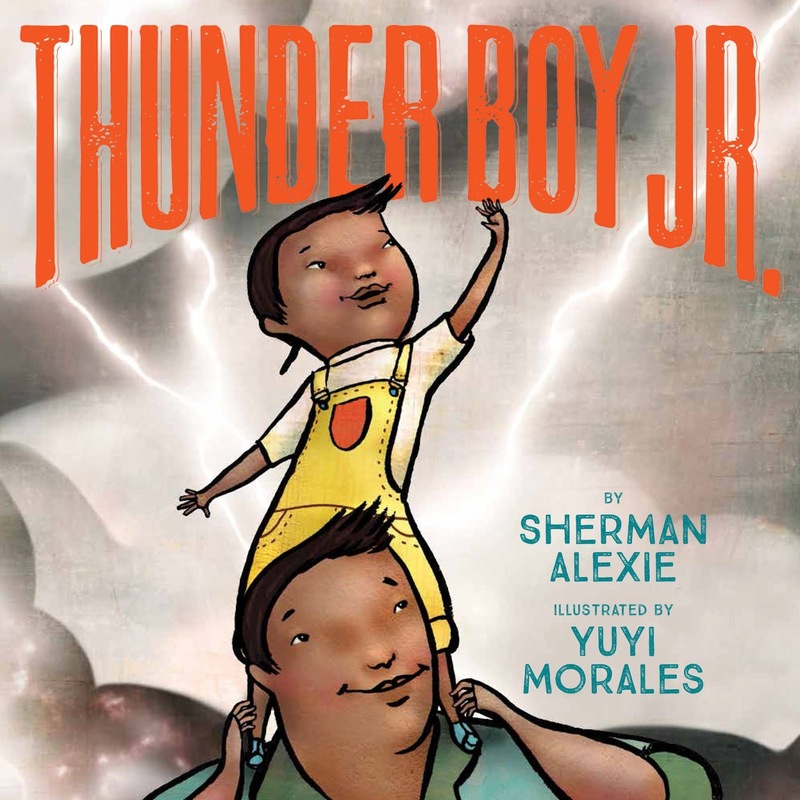 American Indians in Children's Literature (AICL): How to Read Sherman Alexie's THUNDER BOY JR.? 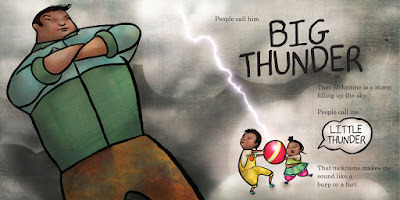 Back in February, I pre-ordered a copy of Sherman Alexie's picture book, Thunder Boy Jr. It arrived on Tuesday (May 10, 2016). The illustrations are by Yuyi Morales. Alexie is doing a significant promotional campaign for the book. He was on The Daily Show two nights ago. Forbes had a story about the book. So did Bustle, Entertainment Weekly... you can do a search and find many others. That's cool. I am happy that a Native writer is getting that level of exposure. In some of these stories, Alexie speaks about invisibility, representation, and similar issues of concern to Native people. Bringing these topics to a broader audience is very important. Because he is much loved by the American public, Alexie is a person who can influence how someone thinks about an issue. In a nutshell, Thunder Boy Jr. is about a little boy whose father, Thunder Boy, named him Thunder Boy Jr. at birth. But, Thunder Boy Jr. wants his own name and identity. This is definitely a universal theme. Lot of kids and adults wish they had a different name. That nickname makes me sound like a burp or a fart. Some will love seeing the word fart; others will not. Here's that page. See Thunder Boy's little sister? 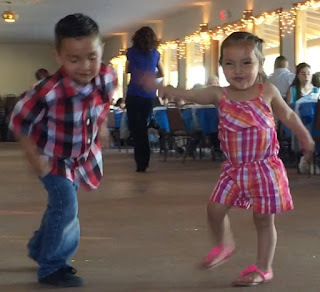 I look at the illustration of the two kids and my heart goes right to my sister's grandchildren and memories of them playing and dancing together at my niece's wedding last week. I think they'll like this book very much. Here's Jayden and Ellie on the dance floor. When her sandal slipped off, she sat down right there on the floor. He kneeled beside her and tried to get it back on, but those straps slide all over and he couldn't figure it out. It was endearing to see them together trying to puzzle through it. He'd look at her other shoe to see if he could see how to make it all right again. I stopped filming when he started looking around for help, and of course, I helped her so they could pick up where they'd left off. In Thunder Boy Jr. we see a warm and loving Native family. I like that, a lot. I see that warmth in Jayden and Ellie's relationship with each other and their parents, grandparents, and great grandparents. 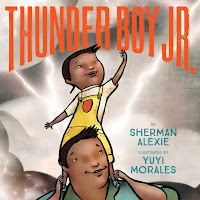 Moving back to Alexie's book: Thunder Boy Jr. tells us that his name is not a normal name. His mother, whose name is Agnes, and his sister, whose name is Lilian, have normal names. He hates his name. He wants a name that sounds like him, that celebrates something cool that he has done. He climbed a tall mountain, so maybe his name could be Touch the Clouds. He loves playing in the dirt, so maybe his name could be Mud In His Ears, and so on. That's where the story, for me, goes into a place that makes me wonder how to read it. Let me explain. What Alexie has given us is a pan Indian story. By not being tribally specific, his story obscures the diversity that Native writers, scholars, activists, parents, teachers, librarians, lawyers... have been bringing forth forever. We aren't monolithic. We're very different in our histories, religions, material cultures, and yes, the ways that we give names. Moving into that name play collapses significant distinctions across our nations. I noted above that I got the book on May 10th. Do you know what was going on then? We were in the midst of a horrible "TrumpIndianNames" hashtag. Last week, Donald Trump took a swipe at Elizabeth Warren's claims to Native identity (her claim is a problem, too, that I've written about elsewhere). The response to him was the TrumpIndianNames hashtag where Democrats, progressives, independents--a wide swath of people, in other words--had a grand time coming up with "Indian names" for Trump. All of that, however, was at our expense. People thought they were very clever. Native people, on the other hand, were quick to object to Native ways of naming being used in this way. So, that is the context from which I read Thunder Boy Jr. If I stand within a Native community, the book is delightful. If I stand outside of it, in a well-meaning but ignorant mainstream US society, the book takes on a different cast. Is that fair to Alexie or to his book? I'm thinking about that question and don't have an answer. I know for sure that if a white writer had done a book that played with Native names, I'd be very critical. Indeed, I was very critical when Jon Scieszka did it in Me Oh Maya and I was very critical when Russell Hoban did it in Soonchild. Is it ok for Alexie to do it because he is Native? Does the book represent inside-humor that marks it as ok? I don't know. This calls back to ancient tribal traditions of many peoples, Native Americans included, where the transition to adulthood involves getting a new name that measures something that you've done, or is predictive, something that your elders hope you become. None of that information is inside the book. What he said on Lehrer's show is lacking in specificity, too. In the interview he said "many peoples, Native Americans included" but given the existing ignorance about Native peoples, I think that his interviews and the book would be much improved by an author's note that provides parents, teachers, and librarians with information about naming. 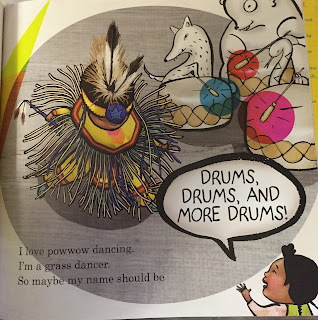 Last thing I want to note is the page where Thunder Boy says that he loves powwow dancing and that he is a grass dancer. I love the illustration, from above, of him dancing. But the drums in the top right? From what I know about powwow drums, that's not quite accurate. Usually, there's a single drum with several drummers, and the drum is on a stand. It doesn't sit on the ground or floor. In sum? A mixed review. That's where I am right now. I really do think that my concerns with the pan Indian character of Thunder Boy Jr. could be addressed with an author's note. Perhaps there will be one in the next printing. Note (May 12, 12:30 PM): Please see the comments below for further discussion of the book, naming, and audience, and the comments on the Facebook post, too. Note (May 13, 2016): See my second post, More Questions about Sherman Alexie's Thunder Boy Jr. This is a really interesting review essay. Thank you for writing it, and for allowing us to follow you as you think through the issues this book raises in our contexts. Thanks for this review, Debbie. I think because Native people have had such a problematic history of identity oppression (when so many Native people were assigned names by the U.S. government)and because there has been widespread misunderstanding and appropriation of Indian naming practices, as you point out, that this is an important subject for discussion in Native communities. Thanks, Veronica. It presents an opportunity for us as readers, and for writers, too, to think about audience. We want Native and POC to write without having to explain things to the White reader. Awareness of that particular conversation makes reading/reviewing his book especially challenging because I actually center Whiteness, and I really don't want to do that. My choice is to ignore it, and I think that is what Alexie did, but now that he's out giving interviews, those questions are put to him--questions about naming, etc.--so I'm really not sure how to go forward. In the Facebook event Alexie did on May 11, someone called in to challenge him on his use of "Native American." That caller implied that we (Native peoples) are also immigrants to this continent, that we're not "Native" to it. Michael, I wondered about how much to include in the review. You, I, and people who know the history of Native boarding schools, know that Native children who went to them were stripped of their names and given ones like Agnes, which Thunder Boy calls "normal" names. His description of some names as "normal" is something that was in my first drafts of the review. I'm thinking about a little kid of Thunder Boy's age, and how a Native kid of that age would characterize names. I'm somewhat confused by the use of normal for Agnes, and not liking Thunder Boy, but then imagining all those other names, and in the end, being happy with the new name his dad gives him (Lightning). Your thoughts about Thunder Boy Jr. Are insightful in on target. It is true that the book illustrations have pan Indian sense about them. Can Alexie be held accountable for this? Perhaps. Perhaps not. Generally speaking writers and illustrators of picture books seldom discuss the project before it is released. They tend to each work in a isolation. It is only when a writer has achieved a certain level of success with picture book sales, that he or she is able to have the privilege to select or recommend an illustrator. This is a new venue for Sherman Alexie, he has discovered that writing a children's book is not as easy as it may appear. Writing a picture book is the most challenging writing, and if you will a most sacred task, because The results impact the hearts and minds of children. Xwat anushiik for writing about the book and the illustrations in your blog. Your insights have the potential to help Sherman Alexie and Yuyi Morales to dig a little deeper, and create an even better picture for all children. We appreciate your contributions, Debbie, because they are making a difference. This is a thoughtful and thought-provoking review, especially for non-Native folks like me. I appreciate the time you took to prepare this charming and timely review. This review is a learning experience for me, as a Native person. I had given the book a quick read through without time to process it, hadn't formed many thoughts other than that I was glad there was another picture book out by a Native author. I read it from the point of view of - me. A Native person. I wasn't reading it from the point of view of 'general public who knows little about American Indians'. I agree wholeheartedly that having an author's note that explains the backstory to this picture book, as well as names Alexie's tribe would have added a lot to boost the information, give non-Natives a feel for the meaning of the story, and give non-Natives a frame of reference. But then on the subject of naming his tribe, the art, gorgeous as it is, seemed to refer to the southwestern U.S. (cactus, snake, Mexican archaeology - or maybe I'm overthinking that? ), and I know Alexie is not from there. So did he intentionally not put any inkling of his tribe so any Native kid could see themselves? Or did I just make that up for him? Was it to have the text match the art better? And Debbie's question - does the book represent inside humor (about the name) that makes it okay? - is certainly valid. Hmmm. I have been reading your blog for years. I trust you to make a "Recommended" or "Not Recommended" call on all new books that you analyze. I have never seen you duck making that determination that is so helpful in addition to reading your complete analyses. Faithful readers of your blog cannot help but notice how you have determined books are "Not Recommended" for far fewer failures and issues with Native content than you pointed out in Alexie's book. Yet you say that your review is "mixed." It's your blog, and you can handle things how you want, but the "mixed review" conclusion is a strange aberration. One wonders if it has to do with the identity of the author, his position as one of the most esteemed Native writers working today, and a desire to avoid a dispute over a title by that writer that is sure to be an award winner. Basically, you gave yourself some cover. I don't blame you a bit, but it is uncharacteristic for your blog. Yes. I didn't say rec/not recommend because I truly don't know what to say in this case. I will say this: this morning I bought a copy to send to my sister's grandson. In their hands, the book will be great. Their read of it won't fall into monolithic land. If the next printing has an author's note, I'd definitely be back with a "recommended" label. For now, I'm still thinking. And so are lots of other Native people, too. The book is the subject of a great deal of conversation in Native circles. I'm not worried about potential disputes with Alexie or anyone else. Within Native literature, it isn't hard to find hard hitting criticism of his work. You can see what Elizabeth Cook-Lynn says about one of his stories, here: https://books.google.com/books?id=GWkCCAN17HcC&lpg=PA89&ots=7wWPxhmxyX&dq=%22elizabeth%20cook%20lynn%22%20%22Sherman%20Alexie%22%20disagree&pg=PA92#v=onepage&q=%22elizabeth%20cook%20lynn%22%20%22Sherman%20Alexie%22%20disagree&f=false . I give up on sharing the link. Those "comments deleted" above are failed efforts. Go to Google books and search for NEW INDIANS, OLD WARS by Elizabeth Cook-Lynn and then go to page 89. What a wonderful review! Would you consider linking it up with the Diverse Children's Books Link-up? You can find it at http://pagesandmargins.wordpress.com/2016/05/07/diverse-childrens-books-link-up-2/. Thanks! I came to your blog this evening because I was responding to a student essay about Thunder Boy, Jr. in which the writer used published research on Native American naming traditions and animal symbolism as "cultural facts" that could help readers unlock the meaning of the storyline and Morales' visuals. The lack of cultural specificity in the book made me uncomfortable, so I'm grateful to you for laying out the problems with representations of a "pan Indian" culture. In this case, unfortunately, I feel like the circle is complete, because those generalized "cultural facts" seem to be validated by the book. I was wondering if you had any specific comments about the pattern of animal symbolism (wolf, bear, snake)? Even the research done by my student recognized differences in how these work for different peoples. In the book, are they part of an eclectic Native American decor or could one tie potentially tie them to a more specific but unnamed tribal or cultural group? I picked up the book for my son. I guess what I liked about it is the space for discussion about why the young boy doesn't like his name? Also, I am not Native, but I did take a concentration in Native American Studies while at college. Never once did I assume he was speaking for all Native peoples, and maybe that is because of my background? I, too, was just really excited to see the book. I am a Native American student currently taking a children's literature course at my local tribal community college for my early childhood education degree. In our class we have had a few very interesting discussions now about Native American stereotypes in books with our instructor as well as our college librarian. In our last class, we reviewed some of the website as well as your blog as a group. It was a good aid for learning as well as ongoing group discussion about this issue. I am also a birth to 3 teacher at my local tribal Head Start and am glad to have found this site to use as a trusted resource to find culturally appropriate literature for the children I work with. Im an Early Childhood Education student at my tribal community college and this was a book we discussed in class as a group when we discovered your blog from our librarian. 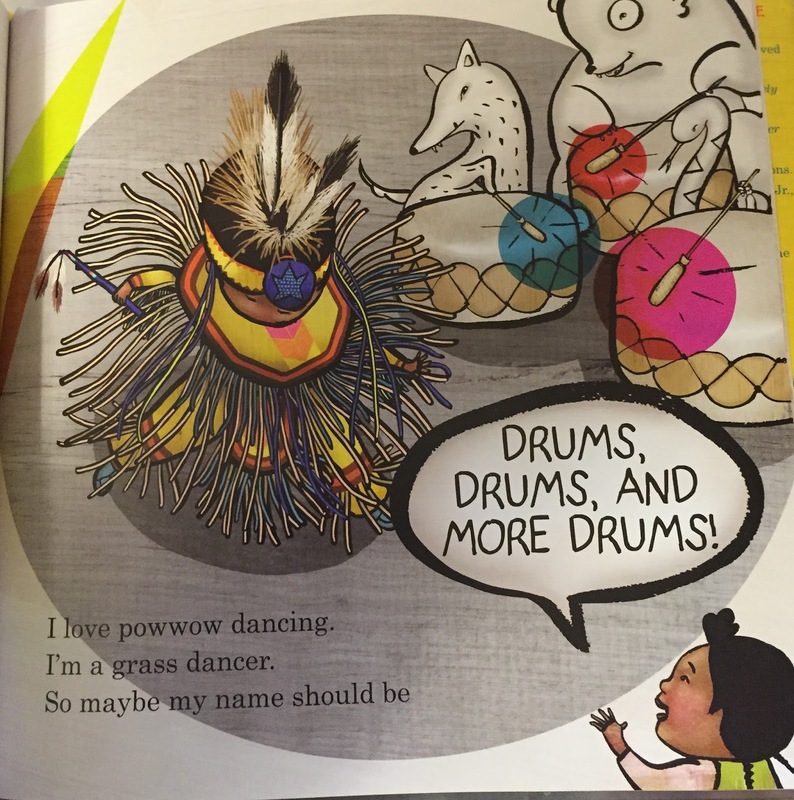 Being a tribal student, I thought this book was funny and very cute. It never occurred to me how controversial it could be if it was written by a non-native. With it being a Native author, it does make the book seem like an inside joke but it also does kind of encourage stereotypes in books. Getting your name is very special and this does give others who dont know the exact process for name giving, the idea that we could be named anything silly. I do agree with your mixed feelings on this book. I would say it is like an inside joke for Natives but for others its like saying our names are a joke. Also you pointed out the drums. That was a detail i never would have noticed but what you had to say is true. They are never on the ground and to be played by animals just adds to it seeming like a joke which does bother me a little. Other than that, this was a very good book, I think it all depends on the audience whether they find this offensive or not.